In this document you'll find more details about the equipment necessary for doing DDA tests. Some of it you can make yourself. A salinity meter is needed for research where fresh and salt water mix. 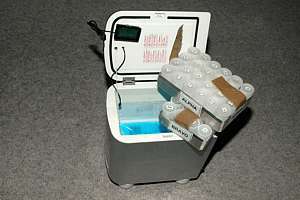 The portable incubator is a modified car fridge and this chapter shows you how to adapt one. 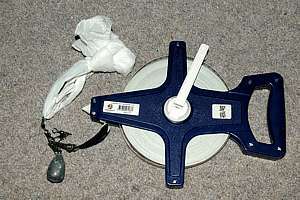 A fibreglass measuring tape was adapted for the job. A champagne bottle can be used to take samples from 5-10m depth. A fine tea strainer improves accuracy. We chose a portable three-digit pH meter from Eutech Instruments as it could do the job and had the right dimensions to engage with the Fuji film containers we used.To understand how a pH meter works, read ph.htm. If you do many frequent measurements, you may need to buy several pH meters because the pHtestr30 takes about three minutes to settle in salt water and almost ten minutes in fresh water. Institutional laboratories may opt to have a rugged but slow portable pH meter for use in the field and a sensitive and fast settling one for use in the laboratory. This will save much time in the long run. Its thermometer is not very useful for reading temperatures because of the large thermal mass of the probe. A salinity meter measures the conductivity of the sample and temperature and calculates salinity from these. Many waterproof salinity meters are on the market. Before you buy one, make sure you actually need one. When mainly working in fresh water ecosystems of lakes and rivers, you would not need a salinity meter although conductivity is often interesting to know. If you work mainly on blue and green water marine ecosystems, you would not need a pH meter either, but when working inside estuaries where fresh and salt water mix, it would be needed for research purposes only. Its thermometer is useful when measuring the temperature of large samples of about one litre. Temperature stabilisation is necessary when the initial bacterial activity is to be measured, which is a very important indicator of ill-health. It is also necessary to compare characteristic curves from time to time and place to place. Because an affordable and portable incubator was not commercially available, we modified a Peltier-effect car refrigerator. A Peltier element is a semiconductor with the property that it warms up on one side while cooling on the other when a current is passed through it. When the current is reversed, the heat travels in the other direction. So it can be used both for heating and cooling. But it is not very efficient and uses relatively high energy for little cooling. But when it is used for warming, it is as efficient as an electric heater. a double-throw slide switch was mounted, fitting an empty space on the control panel. 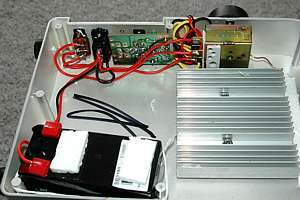 an emergency rechargeable battery was mounted such that it did not impede the cooling air flow. large feet were mounted on the back panel to allow cooling air to flow freely when used as a chest fridge. a hole was drilled to insert a thermometer probe. a door restrainer was mounted, made of nylon string. aluminium trays were folded from thin aluminium sheet metal and flexible handles taped to it but cardboard trays are just as functional. This commercially available model can hold six cans of beer and it is normally used in an upright position. We turned it on its back so that it became a chest fridge. Note the blue freezer pack in the bottom and two trays with 24 vials each. The thermometer is loose and can be inserted through a hole in the door. The probe is placed inbetween the two trays and the display, here shown on the inside of the door, is normally stuck to the outside. The car fridge comes with a cigarette lighter cord. 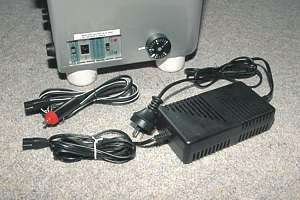 A 12Volt 5 Amp power supply unit is commercially available. 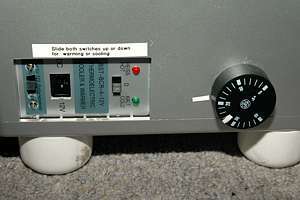 On the side of the control panel a commercially available capillary thermostat is mounted. Also another two-position slide switch is mounted (left). The three-position slide switch controls the mechanism for cooling, off and warming, which is indicated by a red and a green LED light. The back of the fridge becomes the bottom, and inside there is just enough room to accommodate the modifications (red and black wires) and a small emergency battery of 12Volt by 1.3 Ah. Here the battery is shown upside down. The extra slide switch is mounted next to the power socket on left. Not shown on the last image is a cardboard baffle that runs between the large aluminium cooling fin and the thermostat with electronics. It serves to deflect warm air such that the thermostat is not influenced by it. Just to the right of the cooling fin a 120mm long 10mm wide slot was cut, 25mm parallel to the short side, to place the thermostat's bulb against the inner bin. The bulb was pressed down with a brass scouring pad to enhance thermal contact, and the slot was covered with polystyrene foam (just visible on right). The electrical wiring aims to achieve that the thermostat works both for warming and cooling. Another slide switch is mounted and the wiring connected such that the thermostat works correctly when both slide switches are either up or down. A small rechargeable battery is permanently wired to the power socket such that it is charged even when the unit is switched off. With 4A current for warming and 5A for cooling, this battery lasts only for 15 minutes under full power. However, because the incubation temperature is not very much different from ambient temperature, it can last for three hours in most cases. The measuring tape is an important tool for measuring underwater visibility but also for taking water samples in difficult situations, from bridges or wharves. With little effort all rusting screws can be replaced by stainless steel equivalents and the metal end claw replaced by a stainless D-shackle. Using fishing clips, various items can quickly be attached, such as a sinker and a collection bottle. The white shopping bag functions as a Secchi disc, and is simply strung through the D-shackle and knotted to reduce its size when needed. In order to avoid sampling the dense surface water, it is advisable to sample from 2-5m depth. This can be done simply with a heavy bottle like a champagne bottle, weighed down with additional lead sinkers. A plastic champagne cork is tied to the neck of the bottle and connected to the measuring tape. The cork is pressed loosely into the neck as the bottle is sunk. At a depth of up to 10m, a sharp jerk on the tape pulls the cork out and the bottle fills with water from the chosen depth. We discovered that a fine tea strainer improves accuracy because it removes large but invisible particles. More work needs to be done on this, but in the meantime, buy the finest tea strainer you can find and strain the water once before filling the vials with it.